SUNRISE, FLORIDA -- Protective Products International (PPI), one of the leading designers and manufacturers of state of the art concealable and tactical body armor, announced today that it has received notification of a much anticipated, high-profile contract awarded by the U.S. Marine Corps for its Modular Tactical Vest (MTV). 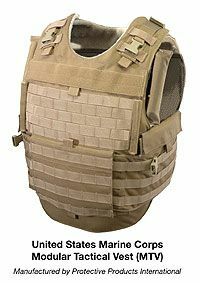 Commenting on today's announcement, Mr. Steve Giordanella, CEO of the Corporation and President of Protective Products International, said, "This major military award is a significant milestone for the Company and demonstrates the U.S. Department of Defense's confidence in PPI's ability to deliver life-saving body armor systems to the armed forces of the United States. The adoption of our products by the U.S. Military indicates that we have attained world-class standards in manufacturing and product development at a time when there is an urgent need for continued protection of U.S. military personnel." Marine Corps Officials say the new body armor offers more areas of protection from bullets and shrapnel, distributes the load better, and will make Marines more combat effective than they have ever been. "Because of our forward thinking of comfort to the wearer and load-bearing capabilities, we do think we'll have a more combat-effective war fighter," said Captain Jeff Landis, a spokesman for Marine Corps Systems Command at Quantico, Virginia. During a three week evaluation period, eighty-nine percent of Marines said they favored PPI's design. Corps officials also said the PPI vest was chosen because of its overall design, fit, comfort, ease of assembly and the quick-release design that makes it far easier to remove in emergencies. Officials see the MTV as a major improvement over the Interceptor OTV, a system developed over a decade ago, which Marines said was too heavy, too cumbersome to wear and generally uncomfortable.